Unclaimed bicycles are taken to the Mike Durfee State Prison in Springfield and refurbished by inmates as part of an inmate work program called "Pedal Power from The Pen". Each year inmates fix up and repaint hundreds of bicycles to be put back into service by underprivileged kids across the state of South Dakota. The bikes are picked up by law enforcement agencies at the annual South Dakota Highway Patrol Law Enforcement Appreciation Dinner and Charity Fund Raiser in Sioux Falls in November. Law enforcement officers then distribute the bicycles to kids who cannot afford their own. Bikes are also distributed to churches and various state and non-profit agencies to be distributed to kids. 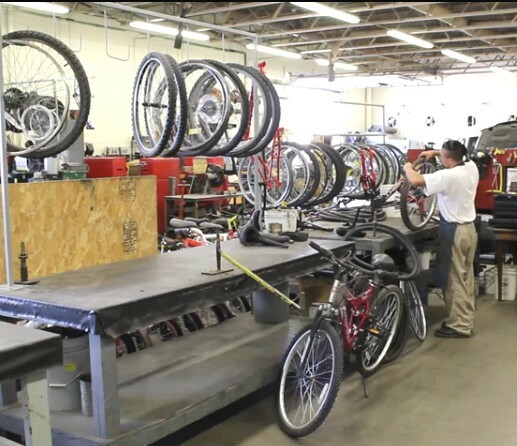 Inmates at Mike Durfee State Prison repair bikes for future use. Refurbished bicycles are distributed at the annual Law Enforcement Appreciation Game Feed in Sioux Falls.